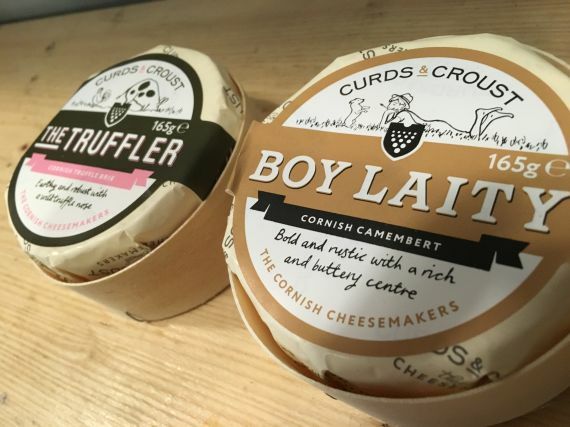 Boy Laity is a rich and rustic Camembert style cheese from Redruth, Cornwall. Mildly pungent on the rind, with a rich, buttery centre, it tastes great and is well worth a try if you like Camembert. It's a little lighter on the nose and palate than a traditional Camembert de Normandie but this isn't a negative as the flavour is smooth and still maintains a satisfying richness. The ethos of the cheesemakers is one of patience, perseverance and knowledge to adapt to the subtleties of the milk (all from within 30 miles) to make an absolutely cracking cheese. We like this sort of commitment to producing a wonderful cheese and due to that, Boy Laity has a constant presence in our cheese room. Boy Laity is great on a cheeseboard in place of a regular Camembert (Boy Laity is slightly smaller too) or on a hunk of baguette with a little drizzle of honey. Award winning Cornish Mature Gouda is aged 10-12 months for a complex flavour, yet moist texture. Tasty water biscuits made with just water and flour.